Savor the earthy flavors of fresh pecans and the sweet tastes of Texas wine, breathe in the musky aroma of leather in an exotic cowboy boot shop, and listen to the sound of a tranquil river as it flows by. Experience all these sensations when you visit San Saba, a delightful place to visit in the Texas Hill Country. Known as the “Pecan Capital of the World,” San Saba has much to offer shoppers, foodies, wine lovers, and those who enjoy being outdoors. Even though it’s just two hours northwest of Austin, San Saba feels like it’s a world away. 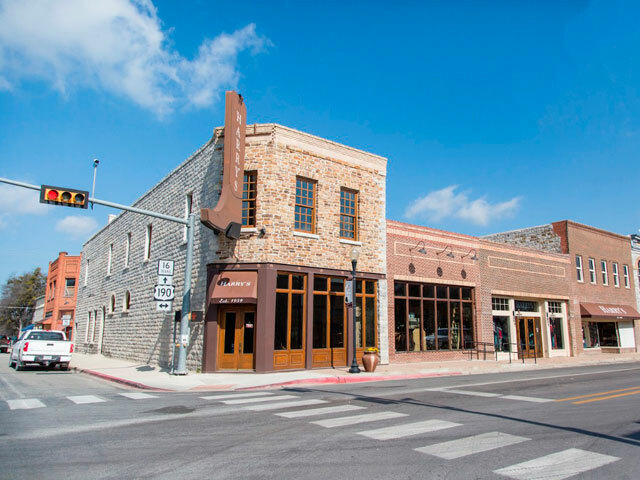 With its narrow two-lane streets and old-fashioned stone storefronts home to a wide variety of specialty shops and restaurants, you’ll probably spend a lot of time in downtown San Saba while you’re here. Start at the beautiful 1911 San Saba Courthouse, a sandstone and brick structure with the phrase “From the people to the people” written above each entrance. Snap a few photos and then let your mood guide you. Want a new pair of cowboy boots? Saunter on over to Harry’s Boots, where your jaw will drop as you take in the massive selection of boots, hats, clothing, and other cowboy gear. For some awesome antiquing and terrific treasure hunting, peruse the vast collection of one-of-a-kind oddities at both J.C. Campbell & Company Mercantile and Madeleine & Me. The downtown area is even home to the San Saba Olive Oil Company, where you can sample and buy a range of pepper-infused olive oils and balsamic vinegars seasoned with pineapples, pomegranates, blueberries, and more. Since San Saba is the “Pecan Capital of the World,” it’s no surprise there are seven specialty shops where you can get your fill of this delicious nut. Whether you’re hungry for fresh roasted or chocolate-covered pecans, pecan pies, or even whole-bean coffee packaged with pecan pieces, you’ll find something to please your appetite. Not only does San Saba have more than its fair share of pecan shops, it’s also home to two wineries. Enjoy award-winning reds and whites at Wedding Oak Winery and wines grown with Texas grapes at Old Man Scary Cellars. Visit both and you’ll have a stunning range of wines to try, including first-rate blends, viogniers, and dolcettos. The best part? They’re just steps away from one another, so visiting both is as easy as the Texas twostep. Although you can get lost in downtown San Saba, there’s much more to this Hill Country destination than shopping and dining. Its parks, such as Mill Pond Park and Risien Park, provide a lovely backdrop for picnics, hikes, and other kinds of fun in the sun. If you’re looking for a test of your long and short game, take on the challenging (and scenic) 18-hole San Saba River Golf Course. For even more adventure, make the brief drive to Colorado Bend State Park to explore the 32 miles of multi-use trails and lay your eyes on one of Texas’ most significant natural wonders: the 60-foot-tall Gorman Falls. 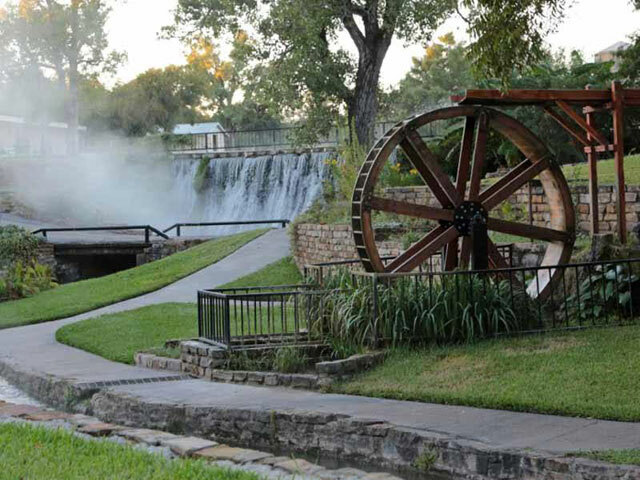 With its pleasant year-round weather, San Saba is a fine place to visit any time of the year. Yet if you plan your stay to coincide with one of its annual events, you’ll get even more out of your time here. Whether you’re looking for a romantic weekend retreat, a shopping getaway with friends, or an escape to the beauty of the Texas Hill Country, you’ll feel right at home in San Saba.